Rasdale Stamp Company, a philatelic auction house operating in the state of Illinois, has uploaded details of Public Auction #435 on its website. According to the company, pre-auction bidding ended on February 16, 2018 at 7:00 pm (New York time) and the live auction took place on February 17 & 18, 2018 staring from 10:00 am (New York time) each day. Rasdale Stamp Company posted a comprehensive statement on its website detailing all the relevant details of the auction. Dubbed as Public Auction #435 on the company's website, the stamp sale was held in the company's auction gallery at 37 Chestnut Ave., Westmont-IL 60559. The auction featured a total of 1,746 lots, which is a bit lower than the 1,918 lots realized in the end-of-year Public Auction #434 held on November 27. For this auction, lots were available for viewing in the company's auction gallery as follows; Saturday February 10th, 9:00 a.m. to 4:00 p.m.; Monday-Friday February 12th-16th; 9:00 a.m. to 5:00 p.m. 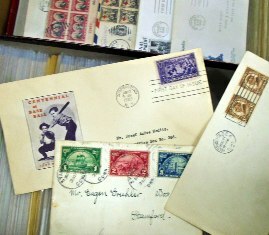 Opening bid were posted on the company's website, www.RasdaleStamps.com and updated until Friday February 16th. Bids were also accepted by mail, fax, and email until 6:00 pm (CST) on Friday, February 16th. Live bidding takes place at 9:00 am (CST) on Saturday, February 17th for Session One and Sunday, February 18th for Session Two.